Before you start writing or even planning to write content, you need to understand who you are writing for. A successful content marketing strategy is tailor-made for your target audience. So, when you decide to go global, cultural differences come into play. There are many factors that shape your target audience. For instance, the well-known buyer persona technique is based on information like demographics, psychographics, education, career, interests, challenges, habits and many other factors that could characterize your audience. But what about culture? The cultural background of your target audience plays an important role in determining their expectations and interpretations. Adapting your content marketing strategy accordingly will increase your customer engagement and your profitability. Why do cultural differences matter? Color: In Western societies white represents purity, cleanliness and innocence. It is associated with happy events like weddings. However, in some Asian countries, such as China, white is linked to mourning and death – and wedding dresses are red. Symbols and pictures: Images including hand gestures can have a very positive or a very negative (even offensive) meaning in different cultures. Formats: Is 04/06/2018 the 4th of June or the 6th of April? A European would understand the former, but an American the latter. Also, how many pounds a kilo is? Or how many liters a gallon is? Well, a UK gallon is 4.55 liters, while a US gallon is 3.79 liters. Wait, is it 3.79 with a decimal point or 3,79 with a decimal comma? Language & style: In English we use “you”, but is it “tu” or “vous” in French, “du” or “Sie” in German? In other words, does the reader expect us to address him in a formal or informal tone? That also depends on language and culture. All the above-mentioned elements –and many more– will have to be localized, to ensure that your message is conveyed to your reader effectively. Marketing, localization and transcreation industries are in charge of adapting such differences. There are many cross-cultural models developed by various cultural anthropologists that can help you determine the tone of your communication with each target audience. One of the most recent is the Lewis Model developed by Richard D. Lewis. It is based on previous models, like E.T. Hall’s “cultural dimensions”, and classifies cultures into three categories based on behavior: linear-active, multi-active and reactive. 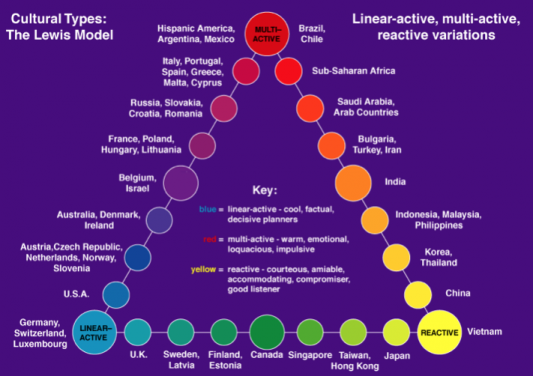 Linear-active cultures, such as the German and Swiss, are well-organized, task-oriented and do things step by step. Multi-active cultures, such as the Italian, Spanish and Greek, put the emphasis on relationships and feelings and do many things simultaneously without following a strict agenda. Finally, reactive cultures, such as the Chinese, Vietnamese and Japanese, are calm and polite listeners. In conclusion, whether you decide to expand into new territories or you already have an international presence, one thing is for sure: in order to keep and increase your clients, you need to localize your content and develop a content marketing strategy that reflects their cultural background and differences. If you want to learn more about this or similar topics on localization and technical communication check out our blog or stay updated by following TCLoc Master’s on Facebook and LinkedIn.